Winemaking is one of the value-adding food processing activities that can be done with fruits to reduce postharvest losses. This is why the government, through the Department of Agriculture (DA), Department of Trade and Industry (DTI), Department of Science and Technology, and other concerned agencies, is supportive of the initiatives for advancing the wine industry in the country, particularly the fruit wine industry. With funding support from the DA-Bureau of Agricultural Research (BAR) under its National Technology Commercialization Program, the Isabela State University-Cabagan, led by Dr. Raul B. Palaje, operationalized the project titled, “One Town, One Product Enterprise (OTOPE): Sustainable Fruit Wine Production and Commercialization in Cagayan Valley.” The two-year project aims to refine and standardize the package of technologies for local wine processing, and empower the people’s organizations (POs) through enhancement of their capacity in winemaking. The team of Dr. Palaje assessed the status and needs of the local fruit wine industry in the region. As expected, there are already existing fruit-based wineries in the locality, with most of these wineries being either single proprietorship or village/organization-managed. They also noted that with research and development (R&D) support, these local wineries can be helped to further elevate their products through provision of technical assistance, skills development, improved marketing strategies and linkaging, and support to packaging, labeling, and equipment. OTOPE is similar to the OTOP (One Town, One Product) concept of DTI which supports micro, small, and medium enterprises (MSMEs) through identifying, developing, and promoting a specific product or service for each locality. Instead of distinct products or services, the OTOPE of ISU focuses on fruit crops. According to Dr. Palaje, the key to move OTOPE forward is for local wineries in Region 2 to adopt a standard processing technology and packaging for all the wine products of the region. For this reason, support on trainings and on wine technologies (e.g., winemaking equipment) are two of the main interventions provided by the project. As a start, consultations were done with the local government units (LGUs) of Isabela, Cagayan, Batanes, Nueva Vizcaya, and Quirino to assess and evaluate the existing local wineries in these provinces. Because of this, the ISU was able to identify and tap the participation in the project of three single proprietorship (SP) businesses and four women’s organizations already engaged in wine production. Aside from the seven local wineries, another project cooperator and technology adopter is the newly-formed Cagayan Valley Integrated Farmers Association (CVIFA), composed of mango farmers and women of Libag Sur. The group was formed due to their common interest of engaging in winemaking as they do not want to suffer losses in their mango farming again. “Nagsimula kami magka-interes sa winemaking dahil sa hindi magandang karanasan ng mga mango farmers dito sa aming lugar. Two years ago, ang mga mangga ay binibili lang nang Php 5 per kilo. Halos 1/3 ng harvest namin ay napupunta lang sa waste kasi tinutusok ng kulisap ang mga bunga. Dahil dito ay bumaba talaga ang income ng mga mango farmers,” shared Mr. Danilo Guinto, CVIFA president. 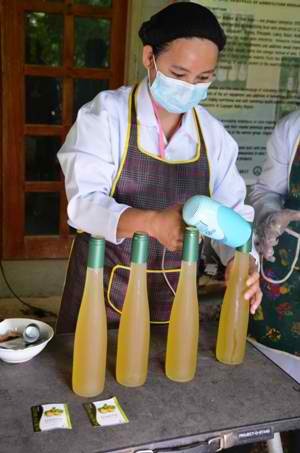 The group, in their first attempt, was able to produce 2,000 bottles of various kinds of fruit wines such as mango, native guava, wild watermelon, pineapple, bignay, banana, guyabano, avocado, and mulberry. The group was also able to forge a partnership with LGU-Tuguegarao City for financial and in-kind assistance. CVIFA is still new in running the business, but because of their linkage with other stakeholders, they were able to place their products in several pasalubong centers in Tuguegarao City. Another project cooperator is Ms. Lorelie Valdez, owner of RLGV Fruit Wines. She ventured to winemaking due to her husband’s medical condition. It is known that wine has therapeutic properties as it contains polyphenols and other bioactive compounds that are antioxidant and antimicrobial. According to a number of scientific studies, moderate wine drinking protects against cardiovascular diseases, dietary cancers, ischemic stroke, peripheral vascular disease, diabetes, hypertension, peptic ulcers, kidney stones, and macular degeneration, among others. The hobby became a business opportunity because of the persuasion of family and friends who have tasted her homemade wine. 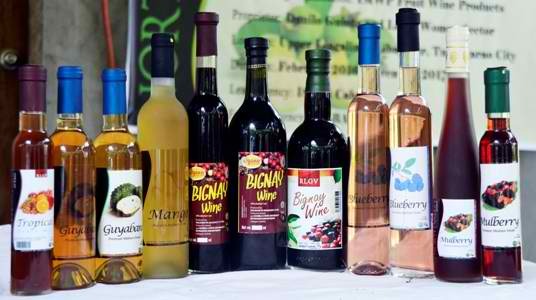 Since she started the business in 2010, RLGV Fruit Wines now has a captive market in Isabela. 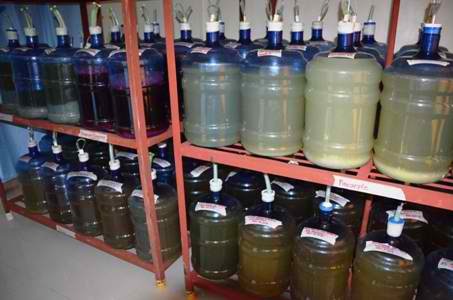 Its wines are distributed to a number of supermarkets and other market outlets in Isabela and neighboring provinces.